This page shows how to edit issues in bulk in Google Issue Tracker. You must have Edit Issues or Admin permissions for the components that contain the issues in order to edit their fields. If you have Comment on Issues permissions, you can view and add comments to the issues only. Select the issues you want to edit. You can also use the keyboard shortcut x to select an issue. When at least one issue has been selected, additional buttons become appear above the search results. Use the Edit drop-down list to apply changes to all the selected issues. 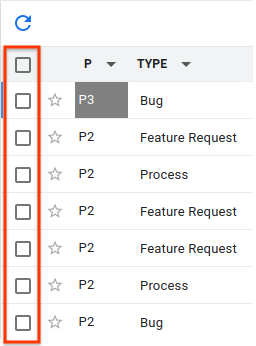 You can edit many of the common issue fields, such as Assignee, Component, and Priority. Issue Type set to "Bug" on 7 issues. Use the Email drop-down list to change who is listed in the CC field of the selected issues. "user@google.com" added to CCs, "user2@google.com" removed from CCs on 2 issues. There is no notification if you try to add an e-mail address that already exists on the cc list, or remove an address that does not exist. Issue Tracker simply treats the action as successful. Use the hotlist picker to add or remove the selected issues from hotlists. Added issue to Hotlist ['Sprints', 'Overhaul'] on 4 issues. Selecting or deselecting a hotlist with its checkbox does not apply your change until you click the Apply button that appears at the bottom of the hotlist drop-down list. View and edit a single issue. Last updated November 16, 2016.